Although double-stranded DNA molecules bind to competent cells, single-stranded DNA enters. As one strand enters, nucleases at the cell surface degrade the other (figure 8.14a, b). Once inside the recipient cell, the single-stranded donor DNA becomes positioned, by hydrogen bonding, next to the complementary region of the recipient DNA (see figure 8.14c). The two regions are said to be homologous. The donor and recipient strands are held together by hydrogen bonds between complementary bases. Then, a nuclease cleaves the recipient cell's single-stranded DNA on either side of the donor DNA. This fragment of DNA is released into the cytoplasm, where it is degraded by nucleases. 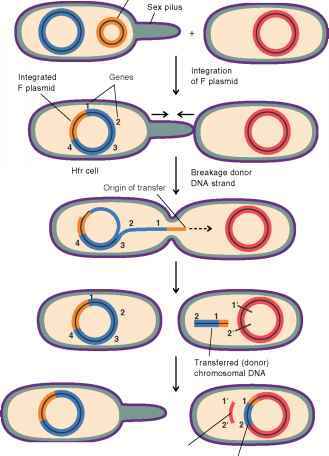 The donor DNA then replaces the recipient DNA precisely, by the process of homologous recombination (see figure 8.14d). This mechanism of recombination in which the homologous region of the recipient DNA is replaced by donor DNA is termed breakage and reunion. The same mechanism also accounts for the integration of donor DNA into recipient cells in both conjugation and transduction. Figure 8.14 DNA-Mediated Transformation The donor DNA comes from a cell that is streptomycin resistant (StrR).The recipient cell is streptomycin sensitive (Str5). Figure 8.15 Electroporation The electric current makes holes in both the cell wall and the cytoplasmic membrane through which the double-stranded DNA can pass.These holes are then repaired by the cell, and the DNA becomes incorporated into the chromosome of the cell. The transformed cells multiply under selective conditions in which the non-transformed cells cannot grow and form colonies (see figure 8.14f). 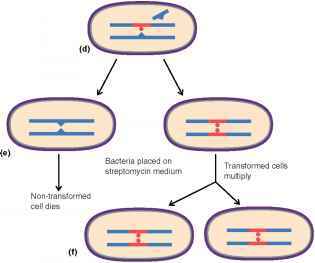 For example, if the donor cells are StrRand the recipient cells are StrS, then only cells transformed to StrR will grow on medium that contains streptomycin. Since only one strand of the recipient cells DNA is transformed initially to streptomycin resistance, only one half of the daughter cells will be streptomycin resistant. The other half will be streptomycin sensitive and will die on streptomycin-containing medium (see figures 8.14e and 8.14f). Although many other donor genes besides StrR will be transferred and integrated into the chromosome of the recipient cells, these transformants will go undetected since the donor and recipient cells are identical in these other genes.